Dubai, UAE, September 17, 2018: With an event at NUO Hotel Beijing, Swiss luxury watch manufacturer Carl F. Bucherer and JD.com, China’s largest retailer, announced their collabora- tion and the launch of a limited-edition watch available exclusively at JD.com. 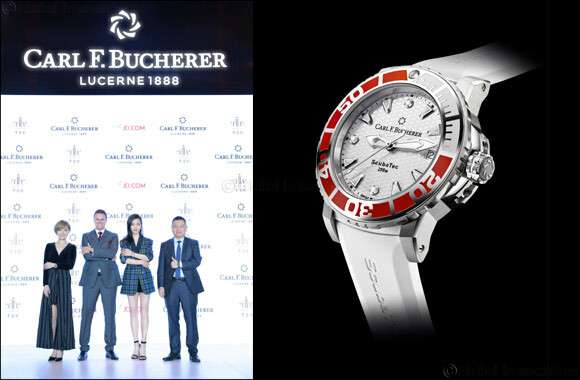 Sascha Moeri, CEO of Carl F. Bucherer, and Belinda Chen, General Manager of JD Watch, welcomed around 150 media representatives and influencers as guests. Li Bingbing, famous Chinese actress and Global Brand Ambassador for Carl F. Bucherer, also attended the event. The online boutique marks the brand’s first entry into the Chinese e-commerce market. In the future, the brand will integrate online and offline platforms in order to provide an all-round shopping experience and more extensive cus- tomer service. “Our exclusive online boutique on JD.com perfectly complements our expansion in China. Besides the open- ing of new top retail stores, it is important for Carl F. Bucherer to further develop its position in China by entering the country’s e-commerce market. Thanks to this collaboration, discerning Chinese consumers will have easy access to an exclusive selection of our latest high-quality timepieces,” said Sascha Moeri, CEO of Carl F. Bucherer, speaking about the new collaboration. JD.com is the leading trendsetter in China’s digital transformation. Its infrastructure and technology are also used by a number of renowned international brands, and the company has established strong partner- ships with several Swiss luxury watch manufacturers. Customers benefit from the convenience of 24/7 shop- ping in the online boutique. Carl F. Bucherer’s foray into China’s e-commerce market is in collaboration with one of China’s largest watch retailers, Harmony World Watch Centre, which will operate and maintain the Carl F. Bucherer online boutique on JD.com. An exclusive timepiece was launched to honor the collaboration with JD.com: the Patravi ScubaTec Lady Limited Edition – available only at JD.com. The watch is limited to 888 pieces, and a particularly eye-catch- ing feature is the rotating ceramic bezel in red, inspired by JD.com’s corporate color. The delicately finished wave pattern dial is adorned with three diamonds. Beyond that, in addition to the white rubber strap, the watch also comes with an additional red rubber strap that can be fitted free of charge at a Harmony service center of the owner’s choice at any time. The Patravi ScubaTec is a watch made for diving and underwater exploration of every kind. In a sturdy case with red highlights and sporty functions, the Patravi ScubaTec is the perfect companion underwater or on land. Carl F. Bucherer has sponsored the Manta Trust, a charity that works to protect the endangered manta ray, for many years. As a sign of the company’s commitment, two of these impressive creatures are engraved on the back of every Patravi ScubaTec case. The Patravi ScubaTec is powered by the automatic CFB 1950 movement, which keeps the time precisely and reliably.